A regular breeding species and migrant. The Cliff Swallow was a common species during the Minnesota Breeding Bird Atlas (MNBBA). Widely distributed across North America, the Cliff Swallow’s breeding distribution ranges across most of Canada and the United States with the exception of the southeastern coastal regions of the United States. It is common throughout its breeding range, reaching its highest densities in mid-America, from the Prairie Pothole Region south to the Texas Gulf coast, and along the Pacific coast from southern Oregon through central California (Figure 1). Elaborate gourd-like structure constructed with mud and attached to a vertical surface, an overhanging eave, or another Cliff Swallow nest. Natural surfaces have been replaced largely by bridges, buildings, culverts, and other man-made structures. This social bird nests in colonies that may number from a few hundred to a few thousand nests. Breeding distribution and relative abundance of the Cliff Swallow in North America based on the federal Breeding Bird Survey from 2011 to 2015 (Sauer et al. 2017). Roberts (1932) provided an interesting account of some of the earliest reports of Cliff Swallows in Minnesota. As early as 1834, explorer G. W. Featherstonhaugh documented the species nesting on granite escarpments along the upper reaches of the Minnesota River. Another observer reported it was abundant along the Blue Earth River about 1848, while Dr. Elliot Coues “found it was so abundant at Fort Pembina on the Red River of the North in 1873 as to be a nuisance” (Roberts 1932). But such early records are few in number, and the species’ true status prior to European settlement is conjectural at best (Robinson and Beer 1955). In 1932 Roberts wrote that “Until about 1900, the Cliff Swallow was an abundant summer resident, breeding throughout the state, less commonly in the heavily timbered portions.” Breeding evidence (including both confirmed and inferred nesting reports) were available from 11 counties widely dispersed across the state including Fillmore and Wabasha in southeastern Minnesota; Jackson and Renville in western Minnesota; Benton, Hennepin, and Scott in central Minnesota; and Aitkin, Cass, Lake, and Polk in northern Minnesota. The Lake County record was of a small colony nesting at Castle Danger, along the North Shore of Lake Superior. Although natural colony sites were likely common prior to 1850, when European settlers began arriving in large numbers, the swallows found an increasing number of nesting opportunities as the immigrants dotted the state’s landscape with residential buildings and farms. Opportunities expanded even further when roads, highways, bridges, and culverts were added. Regardless of this rapid expansion in nesting habitat, the species virtually disappeared from the state in the early 1900s. Roberts included a report from an observer in Pipestone in 1921 noting that the swallow “had not been seen in that part of the state for a number of years, though it had formerly been common.” Extensive field excursions through west-central Minnesota in 1924 and 1926 were not successful in locating a single colony (Roberts 1932). Nevertheless, Roberts includes numerous reports from localities across the state, suggesting that the species was slowly recovering beginning in the 1920s. In their review of the species’ status in the state in 1955, Robinson and Beer discussed the factors most often cited as responsible for the apparent catastrophic decline in the early 1900s, not only in Minnesota but also elsewhere within the central states. Included was the widespread use of paint on old farm buildings, which many thought changed the texture of the surface and prevented the swallows from securing their nests. Other reasons were the deliberate destruction of nests by farmers, and competition with the newly introduced House Sparrow. The authors disputed all three arguments because following the decline, Cliff Swallows increased in abundance despite ever-growing numbers of painted buildings and House Sparrows. Subsequent work confirmed their conclusion that painted barns had little impact on the species (Brown et al. 2017). Robinson and Beer reviewed all known Cliff Swallow records in the state in an effort to decipher the real cause of the species’ precipitous decline, but there was little evidence to suggest any other possible scenarios. They coupled this review with a mail survey to identify the size and location of known colonies. Although the survey did not provide systematic coverage of the state, it revealed a total of 75 known nesting colonies that were active from 1930 to 1953. With one exception, all the colonies were located on buildings or on the undersides of bridges. The majority of records were from the Twin Cities metropolitan region, southeastern Minnesota, and Duluth. The resulting distribution map more likely reflected where active birders resided then where Cliff Swallows were nesting. Despite their exhaustive review, in the end Robinson and Beer were left to conclude that all the hypotheses put forth to explain the swallow’s decline “are but speculation and are not based upon detailed observations.” The coincidence of the rapid expansion of the House Sparrow in Minnesota beginning in the late 1800s and the subsequent decline of the Cliff Swallow in the early 1900s does seem compelling. The aggressive House Sparrow is known to usurp Cliff Swallow nests, and local control of House Sparrow populations has been demonstrated to increase Cliff Swallow numbers (Brown et al. 2017). Perhaps, as highway bridges became a more common feature of the landscape, they provided new opportunities for Cliff Swallows that facilitated their subsequent recovery in spite of abundant House Sparrows. Twenty years later, Green and Janssen (1975) described the Cliff Swallow as a breeding resident throughout the state, least common in the southwestern region and most abundant in the northwestern and northeastern regions. Populations were especially abundant in St. Louis and Marshall Counties. In 1987 Janssen noted that the introduction of corrugated culverts for stream crossings in the agricultural counties had created new nesting opportunities for the species, resulting in even larger nesting populations. He included a statewide distribution map that identified 40 counties where nesting had been confirmed since 1970. Hertzel and Janssen (1998) later added 7 more counties to the list. Dispersed across the state, confirmed nesting records were least abundant south of the Minnesota River. By the time the Minnesota Biological Survey began field survey work in the late 1980s, Cliff Swallows had become far more abundant and widespread in southern and western Minnesota compared to the central and northeastern regions of the state (Minnesota Department of Natural Resources 2016). To date, a total of 382 breeding season locations have been identified by survey biologists. The vast majority were within the Prairie Parkland Province. During the MNBBA, observers reported 2,498 Cliff Swallow records from 29.8% (1,437/4,821) of the surveyed atlas blocks and from 39.2% (916/2,337) of the priority blocks. Breeding was documented in 919 blocks (Figures 2 and 3; Table 1). Records were reported and breeding was confirmed in 86 of Minnesota’s 87 counties. Cook County was the only county where Cliff Swallows were not observed. Thirty-nine counties were additions to Hertzel and Janssen’s 1998 published list of counties with confirmed nesting records. Although Cliff Swallows are widely dispersed throughout the state, they are least abundant in the Laurentian Mixed Forest Province. Whether the Cliff Swallow’s distribution in Minnesota has changed since presettlement times is unclear. There is no doubt, however, that its abundance has increased considerably since the early 1900s, when it was difficult for Roberts and his colleagues to locate a single colony. A similar decline in the early 1900s was not noted in Wisconsin (Cutright et al. 2006) or Michigan (Chartier et al. 2013) but was referenced in recent accounts of the species’ status in both Ontario (Cadman et al. 2007) and Ohio (Rodewald et al. 2016). In Ohio the decline was several decades later, in the 1930s, and was attributed to the growing abundance of House Sparrows. In their comprehensive review of the species, Brown and his colleagues (2017) discussed its range expansion eastward from the core of its breeding range in western North America. Nearly 200 years ago, in the mid-1800s, noted increases in abundance were observed as settlements grew and spread eastward. Not long afterward, the successful introduction of House Sparrows in 1852 precipitated a decline in Cliff Swallow numbers in the northeastern states as House Sparrows aggressively usurped the swallow nests. Today populations of the Cliff Swallow in the northeastern region of the United States remain relatively small. Farther south, competition with House Sparrows was less problematic, as the Cliff Swallows gradually expanded throughout the mid-Atlantic states, including Tennessee, the Carolinas, Georgia, and Florida. In addition to these expansions, populations also are increasing in abundance throughout the Great Plains (Brown et al. 2017). Breeding distribution of the Cliff Swallow in Minnesota based on the Breeding Bird Atlas (2009 – 2013). Summary statistics of observations by breeding status category for the Cliff Swallow in Minnesota based on all blocks (each 5 km x 5 km) surveyed during the Breeding Bird Atlas (2009-2013). Summary statistics for the Cliff Swallow observations by breeding status category for all blocks and priority blocks (each 5 km x 5 km) surveyed during the Minnesota Breeding Bird Atlas (2009-2013). Although Cliff Swallows still make use of natural cliffs and rock escarpments for nesting, man-made structures now are widely used. Suitable sites include the undersides of bridges, roof overhangs, gables, and culverts (Figure 4). A source of mud for nest construction is critical, although the birds may travel several kilometers to locate a suitable source. Many sites that appear to provide ideal conditions for a colony are not occupied, leading biologists to conclude that habitat requirements for the species are not well understood. Foraging habitats typically include open landscapes (Brown et al. 2017). The predominant habitat found within 200 m of MNBBA point counts where Cliff Swallows were detected was marsh/wet meadows, followed by upland grassland and cropland (Figure 5). The association with marsh and wet meadows likely reflects the riparian floodplains of rivers and streams with bridge crossings or culverts where Cliff Swallows nest. Typical breeding habitat of the Cliff Swallow in Minnesota (© Lee A. Pfannmuller). Habitat profile for the Cliff Swallow based on habitats within 200 m of point counts where the species was present during the Minnesota Breeding Bird Atlas (2009-2013). The Cliff Swallow’s colonial nesting habits complicate efforts to assess the species’ status and long-term population trends. The federal Breeding Bird Survey (BBS) remains the only long-term data set available for the species. Using the BBS data, biologists have estimated the North American population to number 53 million breeding adults (Rosenberg et al. 2016). In 2013 Minnesota was estimated to support 4.0% of the continental population (Partner in Flight Science Committee 2013), which places the current statewide population at 2.1 million adults. In Minnesota an average of 175 Cliff Swallows are observed per BBS route in the state each year. In terms of overall abundance on Minnesota BBS routes, it was outnumbered only by the Red-winged Blackbird, which averages 178 birds per route. The next most abundant species in Minnesota was the House Sparrow at a mere 84 birds per route. Although the Cliff Swallow is common in Minnesota, it lies just east of even higher breeding densities in the northern Great Plains (Figure 1). The average in North Dakota was 222 birds per route; farther west in California the average was 516 birds per route. The number of Cliff Swallows per BBS route across North America averages 75 birds (Sauer et al. 2017). Since the BBS began monitoring bird populations in North America in the mid-1960s, the data for Cliff Swallows have revealed a significant but small annual increase of 0.72% per year. In recent years, from 2005 to 2015, the increase has risen dramatically to 4.92% per year (Sauer et al. 2017). Indeed, the Cliff Swallow has one of the most interesting trend graphs of any species in North America (Figure 6). After experiencing a steep decline from the late 1960s to the early 1980s, numbers stabilized for more than a decade and then began an equally sharp increase in the late 1990s. By contrast, in Minnesota the population was fairly level until the late 1970s, slowly increased through 2000, and then began a significant upward trend through 2015 (Figure 7). The average annual change in the state since 1967 has been a nonsignificant 1.59% per year (Sauer et al. 2017). Range-wide the Cliff Swallow population is estimated to have increased 37% since 1970 (Rosenberg et al. 2016). The Cliff Swallow’s early decline may be attributed to the range-wide declines noted among many aerial insectivores when BBS data from 1966 to 2006 were analyzed (Nebel et al. 2010). Within this feeding guild, long-distance Neotropical migrants like the Cliff Swallow demonstrated the largest population declines. The declines were also greatest in the northeast region of the United States, where the density of industrial development is extremely high. Today widespread population declines are still evident across the northeastern United States, southeastern Canada, and the Great Lakes region, including northern Minnesota (Figure 8). On the other hand, the increasing North American population trend in the past 20 years surely reflects the species’ dramatic increase in the central United States from the northern Great Plains south to the Gulf coast, and an expansion of populations in the southeastern United States (Figure 7). 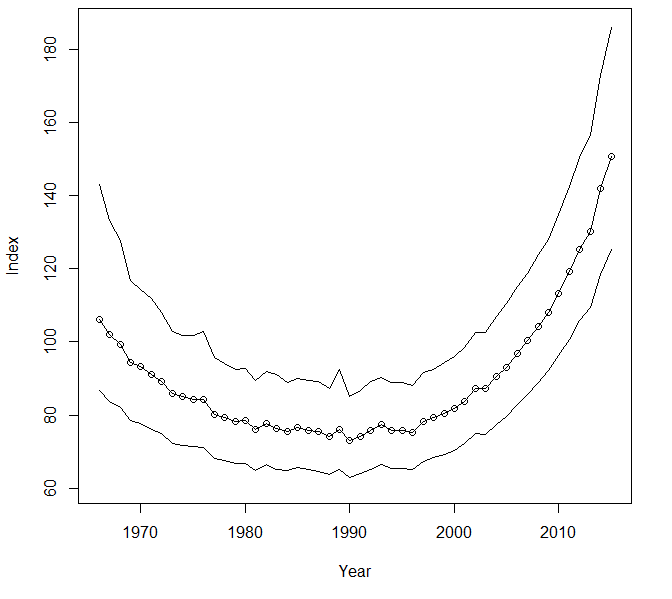 Breeding population trend for the Cliff Sparrow in North America from 1966-2015 based on the federal Breeding Bird Survey (Sauer et al. 2017). 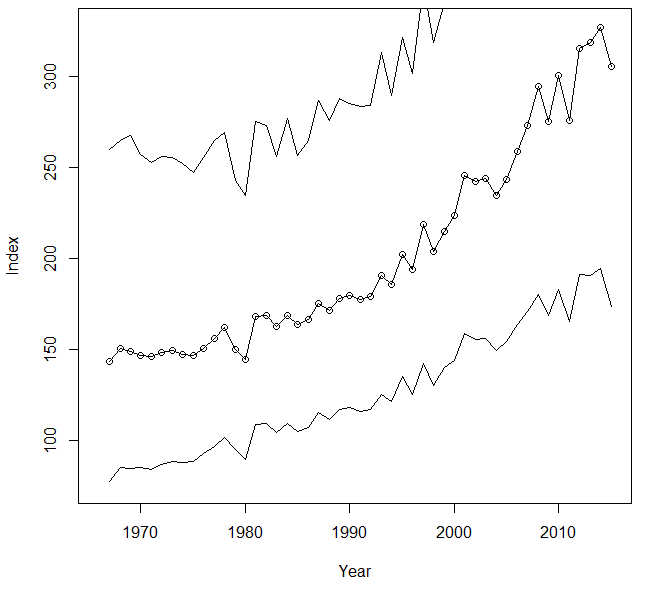 Breeding population trend for the Cliff Swallow in Minnesota from 1967-2015 based on the federal Breeding Bird Survey (Sauer et al. 2017). Population trend map for the Cliff Swallow in North America from 1966-2015 based on the federal Breeding Bird Survey (Sauer et al. 2017). With its wide distribution and increasing population trend, the Cliff Swallow is not considered a priority species for conservation efforts and has been assigned a relatively low Continental Concern Score of 6/20 (Rosenberg et al. 2016). The 2010 “State of the Birds” report assessed the species’ vulnerability to climate change as medium (North American Bird Conservation Initiative 2010). In some localities, particularly in the northeastern United States, management actions to restore Cliff Swallow populations have been implemented and focus primarily on reducing the impacts of House Sparrows. For instance, House Sparrow populations may be reduced by trapping and shooting. Alternatively, Cliff Swallow nests may be destroyed following the nesting season to prevent sparrows from using them as winter roost sites or nesting chambers the following spring (Brown et al. 2017). Nest destruction usually has a minimal impact on nesting Cliff Swallows, who frequently relocate their colonies. The colony sites of the Cliff Swallow, the most strongly colonial species in the swallow family, can become heavily infested with the American swallow bug (Oeciacus vicarious), an ectoparasite. If colonies are still infested the following spring, the swallows simply relocate to a new site (Brown et al. 2017). The species’ colonial habits also occasionally result in efforts to discourage the establishment of large nesting colonies, especially on major highway bridges that require maintenance. Most efforts to discourage these industrious, persistent, and adaptable little swallows, however, are unsuccessful. Robinson, Gerald, and James R. Beer. 1955. “Survey of Cliff Swallow Colonies in Minnesota.” Flicker 27: 148–152.